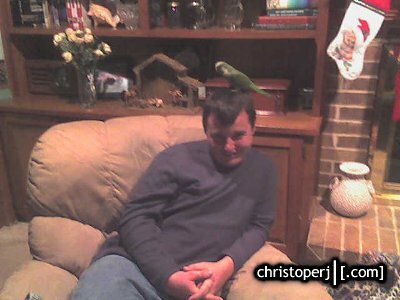 A friend of mine thought it would be funny to put her bird Puffy on my head. Cute bird, fun musical churp. . . very pointy claws. And it was at that point that Puffy decided to clamp down with both claws to (im guessing) let me know he was there. (which explains the goofier than usual look on my face. . .Later, crapped on my leg on his way down -- which amused my dogs when i got home. For some reason, the birds in the back yard just dont let them get close enough for them to know what that smell was. (i cant imagine why). . .